Cold outside? Get creative inside! Butterfly School is a guided daily curriculum to help caregivers structure 15 minutes each day in a stimulating creative activity with young children. Jessie's goal in creating the curriculum is to make learning fun by providing easy projects that nurture critical-thinking skills, literacy, numeracy and creativity at a young age. Featured: help children learn the special pride that comes from having made a gift yourself! Visit "Kid Pages" for materials to explain Lexington's local government to your child (or to a friend)! When Jessie created the pages Lexington was facing a large budget shortfall and turned to voters to decide whether the majority wished to address the shortfall by raising taxes or cutting programs. Many residents (including Jessie) were just learning how the town's local government worked. Kid Pages provide an overview of the budget process and explain how to participate! Since designing these materials, Jessie has stepped up her level of participation. In 2006 she ran a successful campaign to serve as a Town Meeting Member. In March 2009 Jessie was elected to serve a 3-year term as a School Committee member. 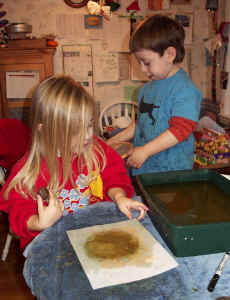 Papermaking Class is a sample of the Studio Classes that Jessie began teaching fall 2009. Adults and children may sign up for small-group workshops that introduce and explore different media: papermaking, bookmaking, artist's trading cards, altered books, art dolls, and unique projects that grow from original stories made here in the Studio. 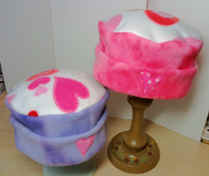 Cheerful, warm and soft, Art Harvest hats are a perfect treat for yourself or someone you think is special!